What does it say about a country when its citizens would rather stay in the danger zone that go home? Only 1,700 Filipinos working in Libya have signed up for repatriation since the Philippine government ordered a mandatory evacuation of its more than 13,000 workers there last month, said Foreign Secretary Albert del Rosario. Despite the danger, many Filipinos in Libya have ignored the government’s order for mandatory evacuation, DFA spokesman Charles Jose told reporters on Monday. “The usual reason we hear from them is that they would rather take the chance. They think they have greater chances of surviving the war [there] than of surviving uncertainty [without jobs] here,” Jose said. It’s no surprise that people are pessimistic about coming home. Let’s get real: they know they have nothing going on for them back home. And before you start berating them, they’re not exactly wrong either: what system is in place to support repatriates? Once back home, you’re on your own. Unemployment rate in the Philippines dropped to 7 percent in April from 7.6 percent a year earlier, according to results of the latest Labor Force Survey released by the Philippine Statistics Authority on Tuesday. 2) Even if there are jobs, many OFWs are unemployable back home..
There’s a discrepancy with what the job market demands and what our folks can offer. Young people are unable to land jobs in the country, either because the skills acquired in school are insufficient, outdated or completely different from what companies want. Specialized training still requires an investment, and usually the amount is just too big for many Filipinos to afford. So off the college grads go to become unskilled workers elsewhere. And even if you did manage to land a job…. 3) The pay is a pittance. In a study conducted by labor group Partido ng Manggagawa (PM), the cost of living in Metro Manila has risen to P1,200 for a family of six members. It said that the cost of living in the capital now stands at P1,217 a day or nearly triple the P456 minimum wage in the National Capital Region (NCR). “This estimate shows that the gap between the P456-minimum wage in the NCR and the present cost of living is a yawning P761, or 167 percent of the ordinary wage,” PM chair Renato Magtubo said. He said PM’s estimate did not include savings and social security, expenses for leisure and recreation and medical expenses. 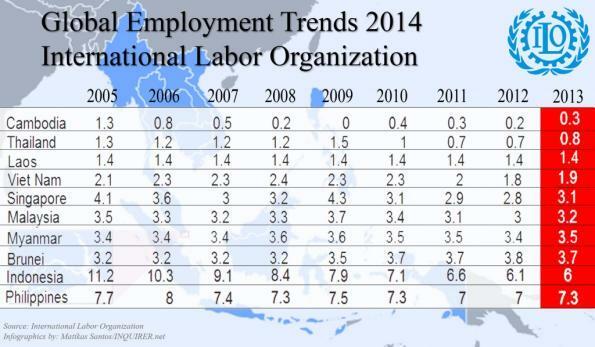 Let’s put this in perspective : Compare the wages in the Philippines with those of our neighboring countries. 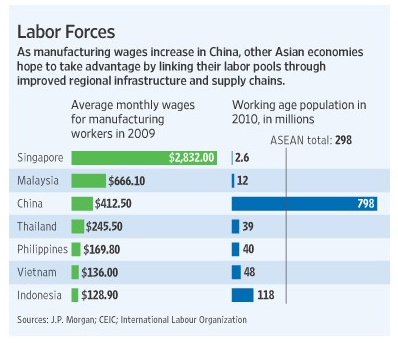 Why the OFWs would rather remain in Libya : What is the minimum wage of Thailand’s competitors? Salary is barely enough to make ends meet. When there are many others willing to slave away for a pittance, the workers become easily disposable and replaceable. Hiring people on a contractual basis is the norm for unskilled workers. Salary is not only incredibly low, but there are hardly any benefits to speak of and no guarantee of contract renewal. At least, in strife-torn Libya with people scrambling to leave, the workers feel less “disposable”. Ok, so let’s say you managed to land a job. Now there’s comes the terrible part, the monthly heartache that comes with getting paid: withholding tax. It’s enough to dampen your spirits and discourage you from working. The Philippines imposes among the highest withholding tax in Asia. Sure we wouldn’t have cared so much if we can see where our Pesos went, if the government had something to show for it. But that’s close to nil. Consider your money gone, flushed down the drain, swallowed by a cayman. The government takes and takes and takes- with no decent roads or even partial medical subsidy in return to reward its hardworking folks. However, the administrator of the religious order left to them, for humanity’s sake, the usufruct of the land on condition that they pay a small sum annually—a mere bagatelle, twenty or thirty pesos. Tales, as peaceful a man as could be found, was as much opposed to lawsuits as any one and more submissive to the friars than most people; so, in order not to smash a palyok against a kawali (as he said, for to him the friars were iron pots and he a clay jar), he had the weakness to yield to their claim, remembering that he did not know Spanish and had no money to pay lawyers. The harvest was abundant and sold well, so Tales planned to build a wooden house in the barrio of Sagpang, of the town of Tiani, which adjoined San Diego. Another year passed, bringing another good crop, and for this reason the friars raised the rent to fifty pesos, which Tales paid in order not to quarrel and because he expected to sell his sugar at a good price. “Patience! Pretend that the cayman has grown some,” old Selo consoled him. The Philippines imposes some of the highest taxes among the ASEAN-6. The Philippine Corporate Income Tax (CIT) is 30%, while Vietnam is 35%, Thailand is also 30%, Indonesia and Malaysia are both 25%, and Singapore is 17%. The personal income tax in the Philippines is 32%, while Thailand is 37%, Vietnam is 35%, Indonesia is 30%, Malaysia is 26%, and Singapore is 20%. 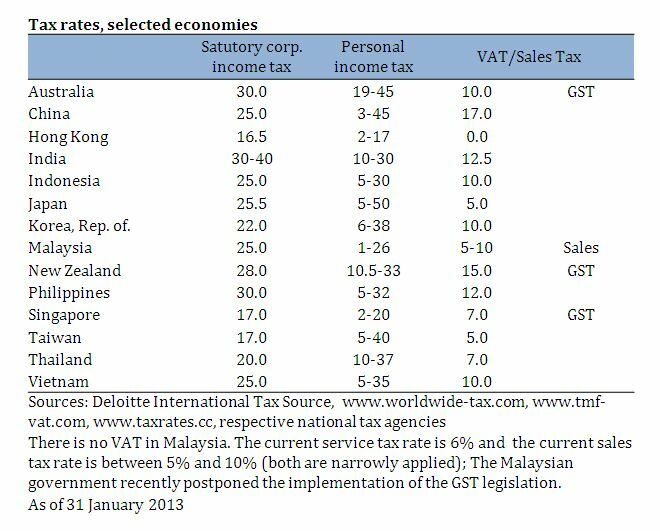 The VAT/sales tax in the Philippines is 12%, 16% in Vietnam, 10% in Indonesia, 5-10% in Malaysia, and 7% in Singapore and Thailand (see Table 79). The Philippines is still unable protect its greatest assets : its people. There are no support systems in place for repatriates. People choosing to come home will have to fend for themselves or face starvation. Pag walang ipon, paano na? The OFWs know this, and that’s why they continue to risk their lives elsewhere. To make matters worse, the government is the parasite that is sucking the working class dry.. while the rich continue to grow fatter and fatter. Who can blame them if they don’t want to be party to this? They have mouths to feed. They have dozens of family members to support. Life must go on – even during war. I agree that OFW’s who have found good jobs abroad are not going to be inclined to throw those valued jobs away to go back to no job, no promise of a job, and lousy pay for whatever work they can find. But the national government would be remiss if it did not say :come home because it is getting unsafe there and we may not be able to get you out later”. So I give the national government credit for working forthrightly for the welfare of the OFWs. The Philippine Overseas Employment Administration exists, and that of itself suggests the government has concern for the well-being of OFW’s. The gap between rich and poor is indeed obscene. The one plus is that the rich have the capacity to do the big construction projects the Philippine needs to unplug Manila and airports and get a real economy going. Given the overbirthing taking place, it will take many many years to get a decent middle class and bridge between rich and poor. You’re right, it’s their obligation to do so. But I think if this govt is sincere about prioritizing the welfare of “bosses” then the govt should show it by going beyond just repatriating the “heroes” (which previous admins have done as well), but by guaranteeing them something in return (either jobs or placement somewhere else). Even small policies can go a long way – I don’t know, something like tax breaks for OFW families or partially subsidized healthcare- i don’t know! I look at the DAP and I don’t see any programs for the OFWs. It’s billions of pesos, and not one program in place for our poor folks slaving abroad. I may be wrong though. To be honest, it’s hard to have positive view of the country- while it’s important to have some long-term plans that can impact the society/economy positively in general, it’s also important to have something that can be felt by common folks, something which can make us think: aha, I’m better off this year than the last. This entry was posted on August 6, 2014 by ikalwewe in Philippine society, politics, Uncategorized and tagged ayaw, filipinos, libya, ofw, philippines, repatriation, umuwi, workers.